Sydney attraction-guides.com - Sydney, Australia attractions guide Sydney Monorail Train travel attraction information, stations and train system, views and tours, opening hours, location and address of Sydney Monorail Train, tel / telephone number, and general tourist information about Monorail Train in Sydney Area, New South Wales NSW, Australia, AU - Last updated 30/10/2012. 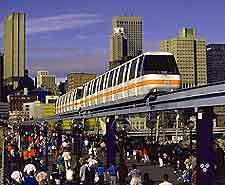 Sydney's Monorail is a state-of-the-art train system that travels around central Sydney, high above the ground. Providing an extremely popular way for tourists to travel, the Monorail features many excellent views of Sydney. The Sydney Monorail offers a regular train service that run every few minutes and is a fairly inexpensive way to travel around Sydney's Central Business District (CBD).